I have always liked chickpeas but desired a simple and versatile recipe; one that I could whip up in a pinch of time to enjoy when I wanted a fast, no-fuss lunch or dinner option for the family. Then I discovered a quick way to cook them & the perfect seasoning combo. So tasty in wraps, on baked potatoes or simply paired with a grain or gluten-free alternative. 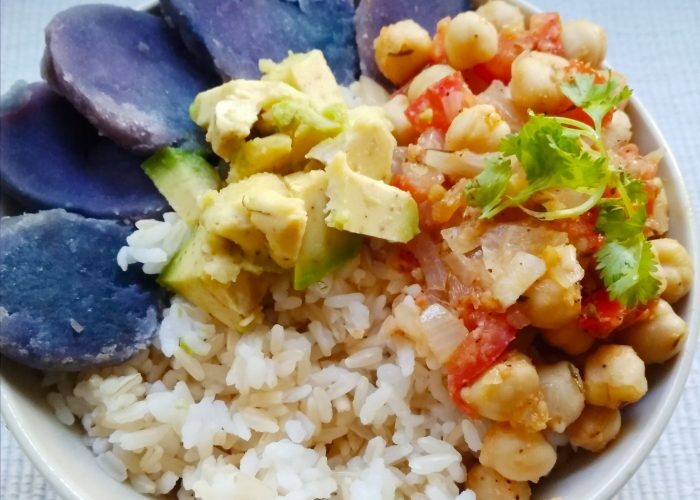 Serve these vegan, egg-free, dairy-free, nut-free and gluten-free Crazy Versatile Chickpeas with rice, couscous, barley, sweet potato, quinoa, bread or your gluten-free alternative of choice. If you don’t want to use a grain, just simply enjoy these inside a lettuce wrap. If you have extras, warm some up the next morning and combine with toast or a bagel for a plant-fueled breakfast! A simple yet delicious vegan, egg-free, dairy-free, nut-free and gluten-free recipe for filling tacos and burritos, or to be eaten with a grain or gluten-free alternative of choice! Drain and rinse a 15.5 ounce can of chickpeas well (if no pre-cooked chickpeas are available to use) and measure the amount to use in the recipe. Want to cook your own from dried chickpeas? See instructions on how to do so here. Dice the onion and tomatoes. Wash a handful of baby spinach/kale leaves (if using). Heat up half a tablespoon of oil in a medium-sized skillet on medium heat. Once the oil is hot, sauté the diced onion pieces in the oil for 2-3 minutes, or until the pieces are soft and translucent. Add the measured amount of chickpeas, along with the ground black pepper, thyme and garlic powder. Stir and cook for another 3-4 minutes. Taste and adjust seasonings. (Note: if you are not using regular canned chickpeas in this recipe, you may want to add a little bit of salt to enhance the flavor of the dish). If desired, add in a handful of washed baby spinach/kale leaves at this time, stir and then cook for 1-2 minutes until the leaves are wilted (optional). If not adding in the spinach or kale leaves, see next step. Right before serving, stir in 1 ½ teaspoons of freshly squeezed lime and stir to mix well with the chickpeas mixture. Ready for serving! If you like, instead of adding in the baby spinach or baby kale leaves, you can add in some fresh chopped cilantro to the seasoned chickpeas right before removing from the stove top. If using home cooked chickpeas, taste the chickpea mix and add additional salt if desired. I have found that when using standard canned chickpeas (not the unsalted canned chickpea version), I did not need to add any salt to the recipe as the drained and rinsed canned chickpeas already contained some salt. For an oil-free recipe, use a small amount of vegetable broth to sauté the diced onions, instead of the vegetable oil. Add this filling to your burrito or taco, and garnish with some freshly chopped basil or cilantro (optional) before consuming, have for breakfast or enjoy as a main course meal paired with bread, grain or a gluten-free alternative! These Crazy Versatile Chickpeas make a great meal prep recipe at the beginning of the week. Don’t get put off by the lime juice listed as part of the ingredients. There is just a hint of lime from the fresh lime juice added into the mix at the end to enhance the flavors of this recipe. I originally created this dish to be a filling inside a burrito, but the possibilities are really endless in how you want to use them. Make extra so that you have enough to use in a creative way later in the week or just pop some in a freezer safe container to freeze and save for later. Recently a friend (who told me she did not like chickpeas and other beans apart from black eyed peas) tried a mouthful of this dish. She remarked, “These taste like black eyed peas!” I then sent her home with a portion of the dish. So, even if you are sure you do not like chickpeas, you might still want to give this recipe a go. You may be pleasantly surprised! One last thing. Are you wondering about this recipe’s name? Kudos to my sister for coming up with this zany yet fitting title. These chickpeas are crazy versatile! If you make these Crazy Versatile Chickpeas, do hashtag @dietitian_mom so that I can be inspired by your wonderful innovative creations!